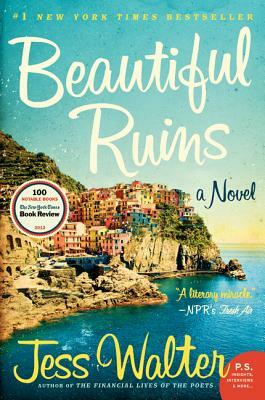 What does the title, Beautiful Ruins, refer to and how does it capture the essence of the novel? At the beginning of the story, Pasquale Tursi is waiting "for life to come and find him." Is Dee Moray the "life" he was waiting for? Do you think most people wait for life—like a movie—to begin? Why? When he first sees Dee, Pasquale thinks, "Life is a blatant act of imagination." Explain what he means. Do you agree with Pasquale? Most of the novel's characters—Alvis Bender, Dee Moray, Shane Wheeler, Claire Silver, Pat Bender, even Richard Burton—have dreams. What are these dreams and how do they parallel and collide? How do their dreams play out in their lives? What would life be like if we didn't have dreams? What happens when they don't come true? Americans pride themselves on the "American dream." What does this term mean to you? Do you think it is still attainable today? How much of our notions of the American Dream are shaped by Hollywood? Think about Shane Wheeler, the screenwriter, whose life's motto is Act as if ye have faith and it shall be given to you: "His was an outlook fed by years of episodic TV, by encouraging teachers and counselors, by science fair ribbons, participant medals, and soccer and basketball trophies—and, most of all, by two attentive and dutiful parents, who raise their five perfect children with the belief—hell, with the birthright—that as long as they had faith in themselves, they could be anything they wanted to be." Is faith enough—or hard work—to make our dreams come true? Can we truly be, achieve, or do anything we desire? Claire Silver, the chief development assistant for legendary film producer Michael Deane, was enchanted by the magic of Hollywood when she saw Breakfast at Tiffany's two days before her tenth birthday. How do you think this movie shaped who she became? Was it for better or for worse? Is it the idea of fame that draws people to Hollywood, or something else? Is Hollywood as influential on lives today as it was through much of the twentieth century? How would you characterize Michael Deane? One reviewer commented that he "has finer hidden instincts than the ones he has allowed to shape his life." When we meet him, Michael Deane seems like a parody of a Hollywood producer. What are the driving forces that propel his actions and how do they confound our expectations? At the center of the novel, though largely offstage, is the legendary Hollywood production of Cleopatra. How is the movie symbolic of the novel's themes? How does Hollywood both fuel fantasies and destroy dreams? How is this demonstrated in the experiences of the novel's characters? In Hollywood, everything happens because of the pitch. Have we become a nation of individuals pitching to each other? How would you pitch your life story to someone? How would you pitch Beautiful Ruins? In the present day, the elderly Pasquale shares the story of his first meeting with Dee, describing it as "the moment that lasts forever." Why is this so for Pasquale? How does this revelation influence Shane and Claire? Have you ever had a moment like this? How do dreams—like love—inspire us and hurt us? Do you agree with Michael's adage: we want what we want? Do you think this changes with age and maturity? Years later, Alvin tells Dee, "All we have is the story we tell. Everything we do, every decision we make, our strength, weakness, motivation, history and character—what we believe—none of it is real; it's all part of the story we tell. But here's the thing: It's our goddamned story!" What about life—your own or someone you know—is real? How much do we control in our lives? What happens when we let other people tell our story for us? How would you describe Beautiful Ruins?